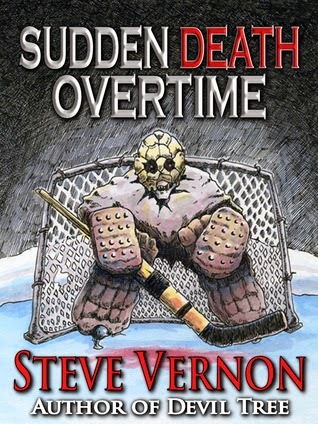 Sudden Death Overtime by Steve Vernon is available at Amazon and BooksAMillion. Meet Sprague Deacon - one of the toughest old-time hockey players who ever skated upon a rink of hand-poured ice. Sprague was born and raised and he expects to die here on the Northern Labrador coast. What he did not expect was a tour bus full of vampires - none of whom glitter in the least bit - to pull into his town and begin lowering the population level - one corpse at a time. Sprague and his three best friends - an over-the-hill never-say quit bush league hockey team from Northern Labrador go toe-to-tooth with a tour bus full of vampires in an immortal-stakes showdown of street hockey? For the answer - throw Paul Newman's Slapshot into a blender with Steven Niles 30 Days of Night and hit frappe! Hockey Saves Hope's End From Vampires - if Hope's End has a newspaper, that would be the headline the day after this book takes place. I loved the characters and how fleshed out they were. The characters immediately pulled me into the world of Hope's End. Judith Two Bear depressed the hell out of me, probably because of something that's easy for me to do with Vernon's work: I immediately begin plugging in people I know in real life as the characters starring in the movie-version that runs in my head while I read. I wound up casting myself as Judith but, once I started casting my friends in the roles of the male characters, I laughed my bum off when the characters got up to their antics. The level of violence reminded me of many paranormal TV shows like Buffy and Supernatural. It's there but it's not the star of the show. There may be typos in the book. Or maybe there's not. It's hard to tell what's intentional character development and what's an error. Or maybe it's the English language crossing the American-Canadian border. I don't know (and I don't care). It's the matter of pluralizing the word beer. Do you or don't you? It was easy to write off possible editorial stuff as character development so I did because, as far as I'm concerned, it's personal preference, kind of like deciding which brand of beer to drink while reading the book (I chose Harp Lager because it's brewed and bottled in Canada and this was a themed read for me).